Well, this has been a winner of a morning in western Maryland! Crisp, I kid you not, CRISP air greeted me as I followed Sidekick Pauli out into the yard this morning. Like Autumn…what an absolute blessing after the pea souper of a week we have had! Sweetie and I headed over South Mountain for a walk at Antietam National Cemetery. I have been to the battlefield many times, but never the cemetery. It did not disappoint. I sought out the graves for Indiana soldiers killed in battle and perused for last names that I knew from home. The only one I found was ‘Evans’. I moved on through the pines and circled around to the other side of the cemetery. Here I found a grave that seemed oddly out of place. This grave belongs to Goodloe Byron, a member of the U.S. House of Representatives from 1971-1978. His term ended when he died of a heart attack while running on the nearby C&O canal. He was an avid runner having completed several marathons…and seemed to believe he could eat whatever he wanted. Unfortunately, not so. Hmm, okay…let that be a lesson to us all! Anyway, interesting story, but still not sure why he is buried with civil war soldiers. Exiting the cemetery, we drove down to Burnside Bridge and stolled down the Final Attack trail and Union Advance trail. Refreshing cool breezes kept us perfectly content with life as we rounded through sunny fields and then into cool dark woods. We found plump ripe rasberries, a variety of wildflowers, and blue birds. Ahh, this is the kind of morning that makes me want to live forever! Heed that lesson from G. Byron’s premature death and Hike on! And Then, Out Came The Sun! Oh boy, to say we’ve had a spell of rain in the Mid-Atlantic would be a half-truth. 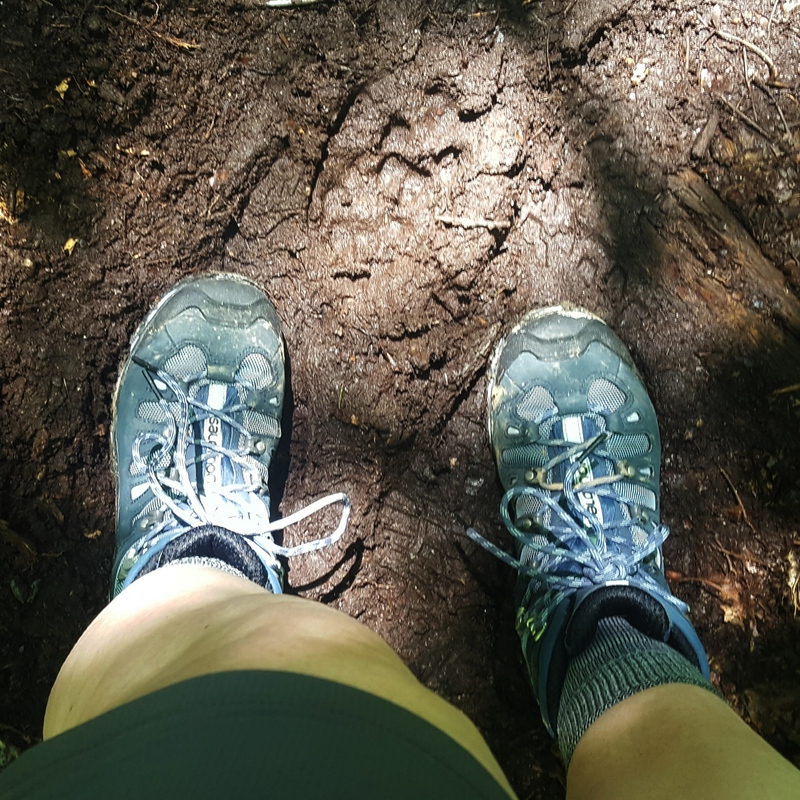 I feel for all those hikers out there on an AT thru-hike or section hike. They just haven’t had many dry days in the last month. As a day hiker, I seem to lack that same willpower to hike when raining. So I have been literally crawling in my own skin as rain continued to pour down over the last several weeks. There were windows of opportunity, during which I would hurriedly scamper down a trail to get back to my car before the next sky dump occurred. Most of the time I’ve been lucky! And then, out came the sun! We got a bonified reprieve today, huzzah! 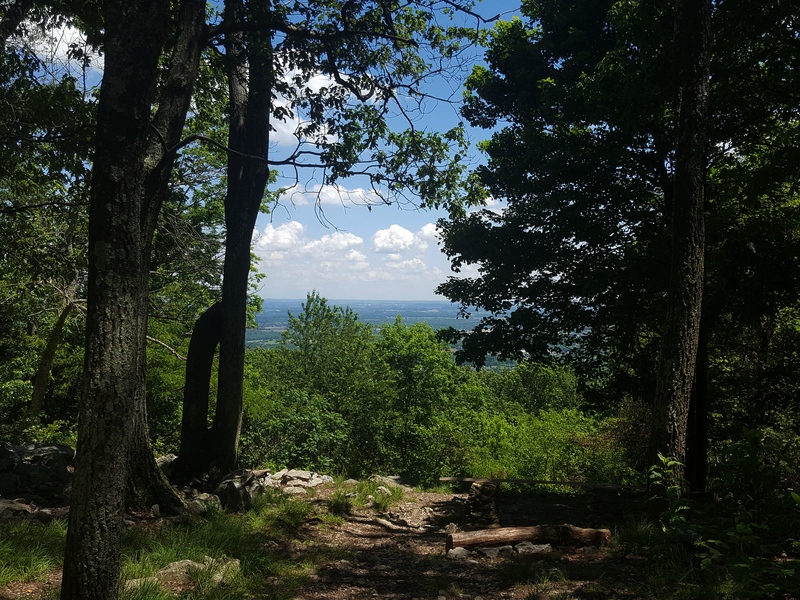 So even though I’d awakened with a migraine, I remained optimistic, popped some meds and took off for Catoctin Mountain Park. I parked at the Visitor Center, then headed off down the trail towards Headquarters. 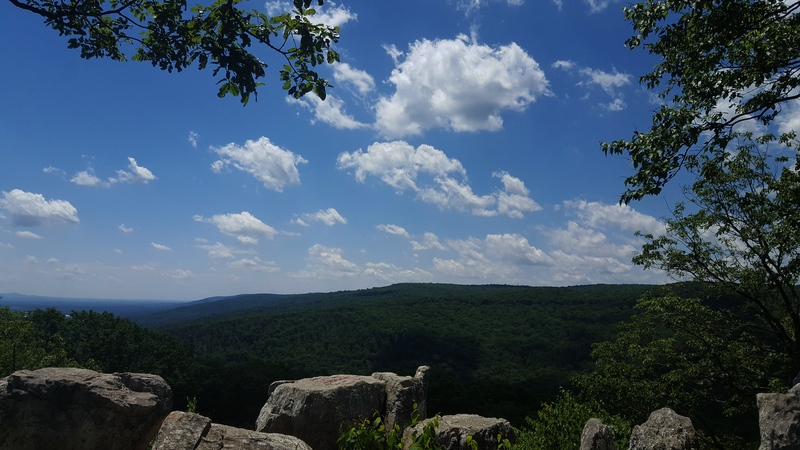 I planned a loop hike to Chimney Rocks and Thurmont Vista. My feet stumbled a bit on the rocks as my brain still struggled with bad migraine juju. As I rounded the corner at Headquarters and headed uphill my feet got in sync with what my brain was telling them to do and the going got much easier despite going up, up, up! Oh, and the Mountain Laurel, wow! It was abundantly flowering. Just lovely! Once on the ridge, I was able to breathe deeply the scents of a forest made more delightfully pungent after many days of hard rain. Inhale…ahhhhhhhhh! New blowdowns had exposed bug-ridden interiors and the birds voiced their happiness with delirious abandon. A glorious morning to be alive! I took a sit down at Chimney Rocks. Shedding my boots, I made myself comfy leaning into the coolness of my stone seat. Getting lost in the blue of the sky while letting my thoughts filter through my head like the parade of puffy, white clouds making their way across the sky was a luxury. I had no idea how long I sat there, and didn’t care. I got up when I got up! 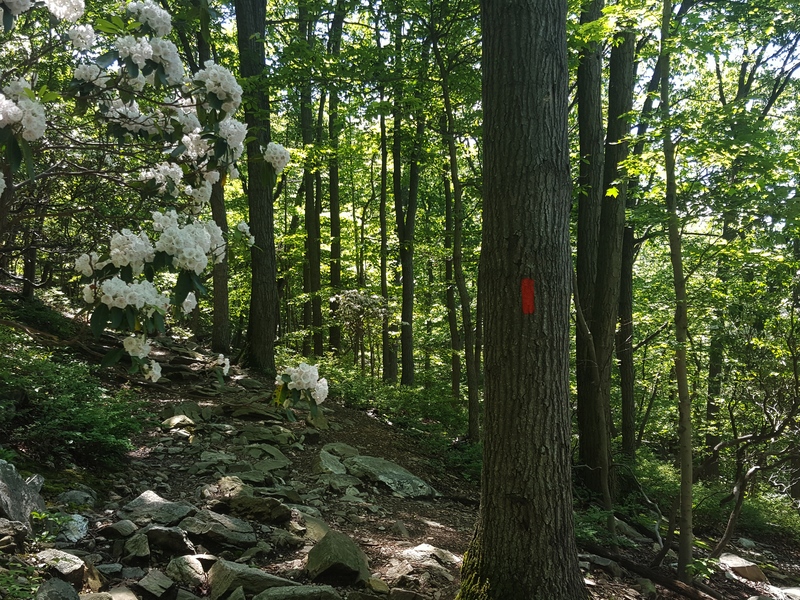 The time at which I left Chimney Rocks was apparently the perfect time to continue on down the trail as I passed seven hikers headed for the spot I had vacated. Sturdy new benches all along the trail, and shiny new trail signs! 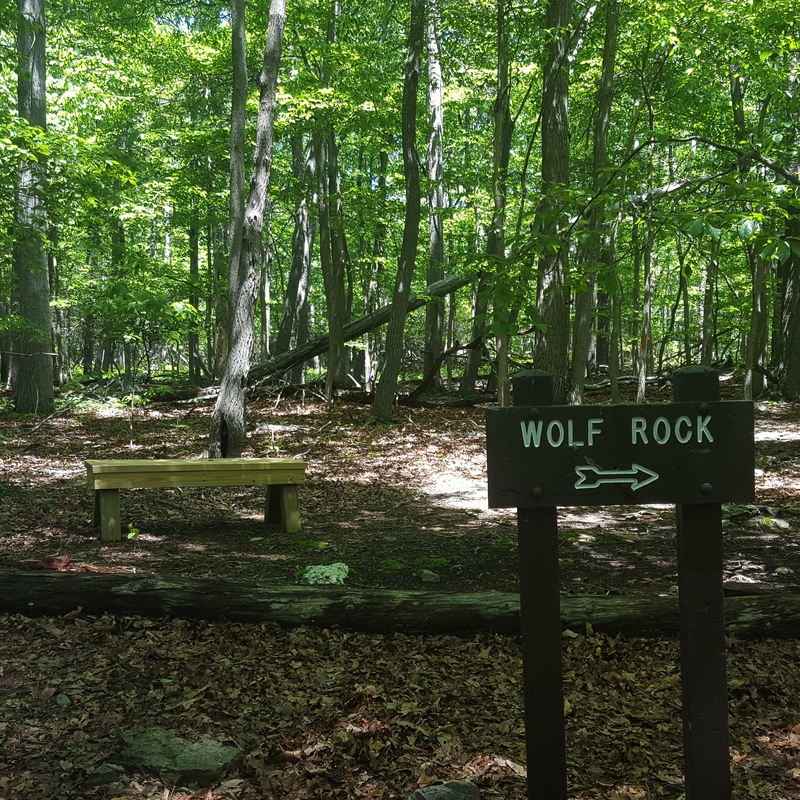 Making a quick pass of Wolf Rocks, I headed off in the direction of Thurmont Vista. At a fork in the trail, I passed a large group of hikers headed to Wolf Rocks…so glad I was going against traffic! I had Thurmont Vista all to myself! Down the hill to the next Trail sign. 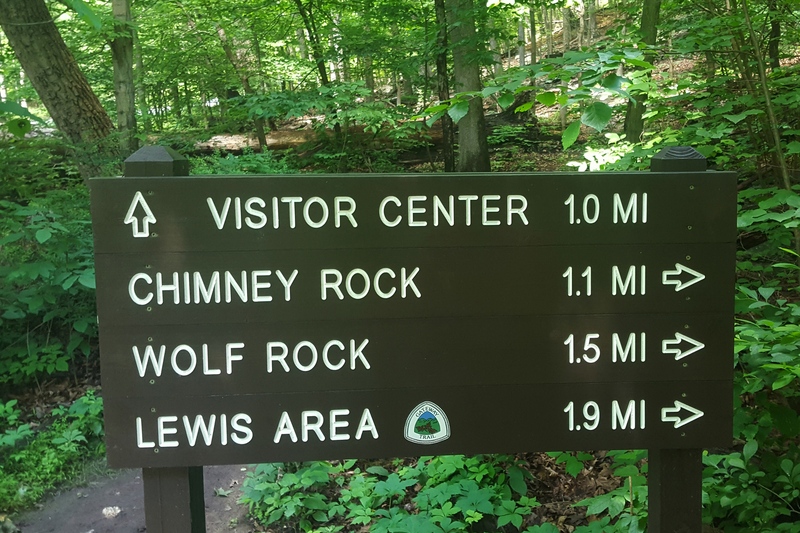 “Visitor Center 1 mile, Hog Rock 1.5 miles” Decision time. Big Loop (8.5 miles) or Little Loop (5 miles)? I looked at weather app on my phone…hmmm, possible thunderstorms at 2 pm (time was 1:52 pm). I looked at the sky…some darker clouds over to the west. I looked at the trees, breezes picking up and some trees had flipped their leaves. Well, I wasn’t going to push my luck after such a delightful morning! Here’s to getting to the car without having to outrun a thunderstorm! Hike on!